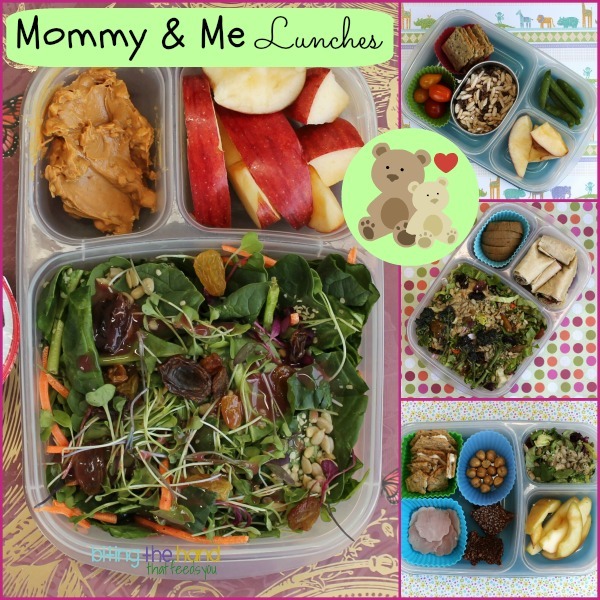 Tuesday, 5/7/13 - Since Baby E had shown an interest in my salads (by horning in and snarfing down MY lunches!) I figured I'd see if she was still interested if she had her own. So I made us matching salads! 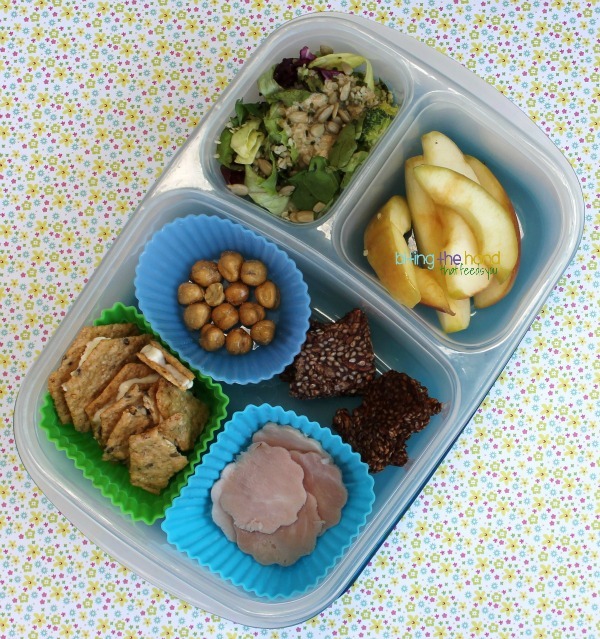 I had tons of "ends" left over from the Pink Dip and ham with lettuce (gluten-free) tortilla roll-ups made for our Teacher Appreciation lunches that day, so I went ahead and packed some straight into my lunch! 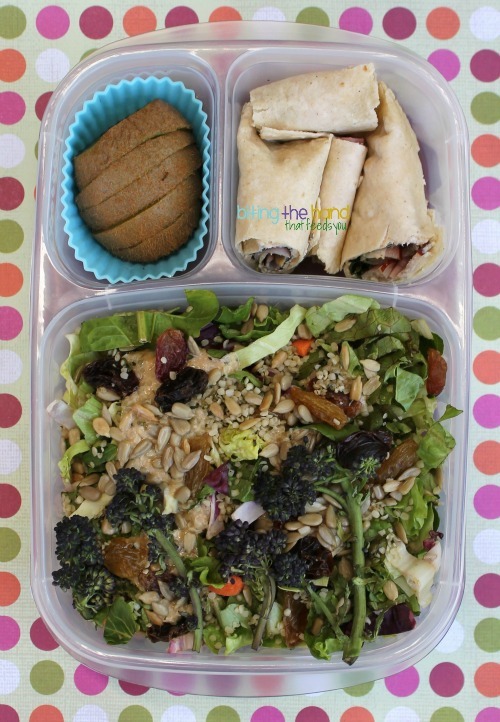 I used my pre-prepped salad mix, and added a few stalks of purple broccoli, plus the dry toppings and dressing, since this was packed right before lunch, which I ate in the car while Baby napped during E's afternoon preschool. I had gotten an assortment of GoPicnic meals when there was a Groupon-type deal for them online. I figured it couldn't hurt to have shelf-stable gluten-free artificial-free meals laying around, ready to grab in an emergency. The pepperoni one was part of the deal, although normally I wouldn't have chosen to buy it. Z and I aren't spicy fans, and I despise processed meats. Baby was entranced by these boxes with pictures of tantalizing foods on them, within reach since Mama hadn't yet found a space for them in the cupboards. And her Dadda is a sucker. So there were several days where she lived off of GoPicnic meals whenever he was home. Except she either didn't really like most of what was in them, or else it was a choking hazard and we wouldn't let her have it. The cheese and Crunchmaster crackers were left over from a Pepperoni and Cheese GoPicnic meal. I had eaten the pepperoni, so it wouldn't just get thrown out, but I figured she might actually eat the cheese and crackers part. I had gotten a box of BumbleBars to fill out an order to get the free shipping at Soap.com or Drugstore.com or something, and Baby was hooked on them! Her sucker Dadda let her feast on those at will as well. She had left some bits uneaten, so I saved them for her lunch. As you can see, I had a little helper when I was cutting the apples. But I'm a mama, and I'm used to feasting on drool-covered, half-chewed, bites-missing foods. 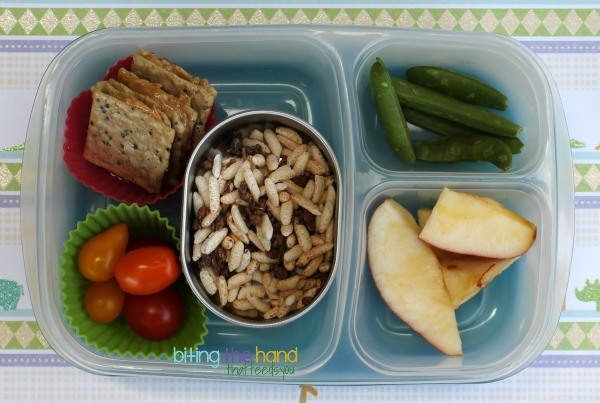 puffed rice cereal with Enjoy Life chocolate granola, organic sugar snap peas and salvaged apples. Baby doesn't usually eat her gluten-free bread, and I had been making PB or SunButter cracker sandwiches for Big Sis around that time too, so I tried some out to see if E would like them too. She licked the PB off, as per usual! Another way to help her get her grains is through cereals. She had been cadging my puffed rice cereal (not rice flour mixed with other stuff then baked into little "puffs" - actual whole-grain puffed brown rice. Like popcorn. Poprice!) So I mixed some with a little bit of Enjoy Life chocolate granola to make it more enticing. The oval container it's in came from a dollar-type store, and has a flexible air-tight lid, so they could stay fresh and not get soggy. 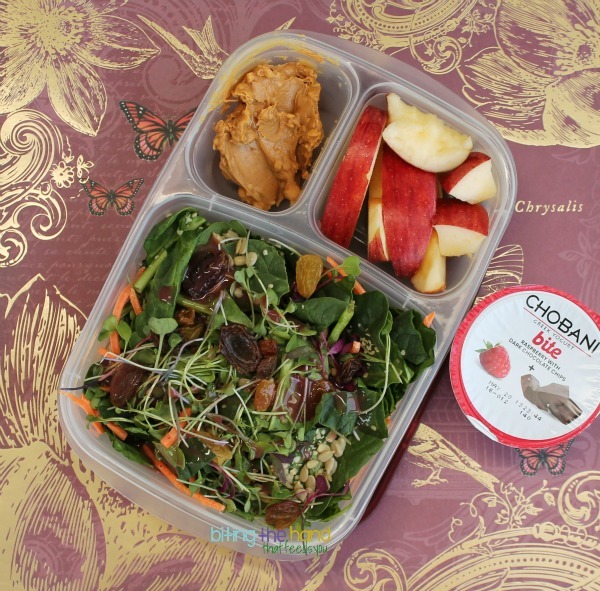 Plus to keep those little crunchies from flying around inside the lunch! She eats more bread/cracker/tortilla and less peanut butter only when I make them rather than my husband -- I think because I put thinner layers of peanut butter on than he does.